This might seem like a strange topic, but it’s very applicable for me, and I’m going to assume for many other anime watchers world-wide. 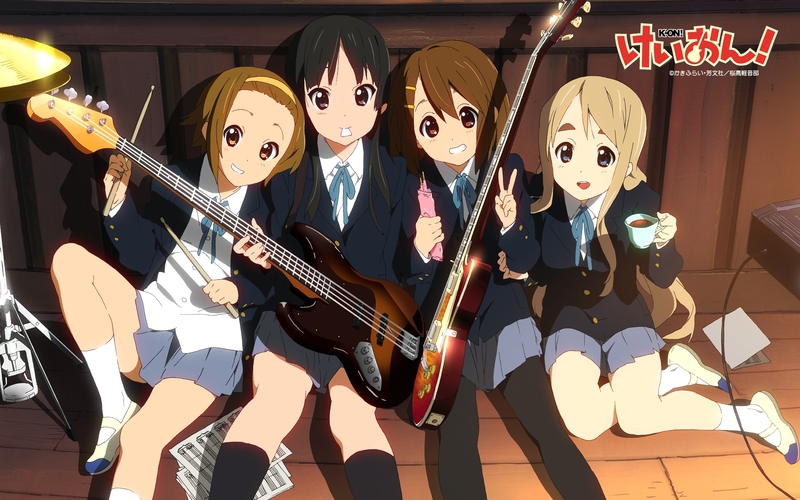 From left to right: Ritsu, Mio, Yui and Mugi. Meet the girls of K-on! …and let’s say I’m particularly into K-on, so I watch four episodes in a row. It’s now about 1:00 AM or so and I decide it’s time to go to sleep, so I drag myself out of bed to the bathroom to brush my teeth. I turn on the light and see in the mirror… a REAL person, with a pimple, a bit of purple colour under my eyes from staying up late too often, messy hair, etc. I could go on but I think you get the idea. I’m not an anime girl! That is impossible. I’m 3D. As you can tell from the picture above, all of these girls have perfect skin, small faces, slender bodies, nice hair, etc. Once again, I could go on but you probably get the point. They are drawings! You can’t be that cute and adorable all the time in real life. But when you get sucked into an anime full of such adorable girls, you kind of temporarily forget how… hmm… how do I put it, “fleshy” real people are! You just have to remind yourself every now and that real people don’t look like Mugi. Now I hope I don’t have to remind everyone that I do find pretty much all body types beautiful. I like laugh lines, freckles, super slender girls, super curvy girls, everyone is awesome! So I hope no one here thinks I am holding these small girls above others as some ideal. I’m certainly not. It’s just that when you get sucked into this world of tiny cute people you forget what real, beautiful people look like. But I do admit that if Mugi were a real person I’d probably stalk her… so it’s a good thing she’s not.